Complex carbohydrates consist mostly of long strands of simple sugars that form starch molecules. Plants store these large molecules for future energy needs. Simple carbohydrate sugars occur in fruits, vegetables and dairy products, and are added to sweet foods, such as cookies, cakes and soft drinks. The body absorbs these carbohydrates quickly, while complex carbs take longer to digest and absorb. This slower process is beneficial for creating a slow, steady increase in blood glucose matched by a slow, steady increase in insulin production. Whole grains are a good source of complex carbohydrates. 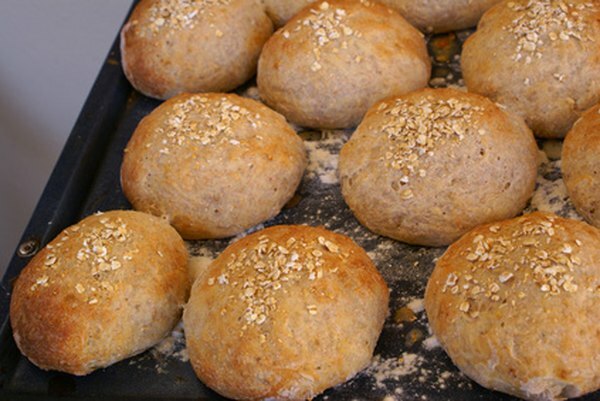 These include barley, wheat, buckwheat, brown rice, oats and rye. You can obtain complex carbohydrates by eating wholegrain cereal, bread and pasta. Eating oatmeal is another option, and so is adding barley and brown rice to soups, casseroles and stir-fry meals. Refined grain products such as white bread, biscuits, pastries, white pasta and sugary cereals also contain some complex carbohydrates. The refining process creates simple carbohydrates, making these foods are not as healthy for you. Several vegetables are good sources of complex carbohydrates, and are often known as starchy vegetables. They include cassava, parsnips, potatoes, rutabagas, sweet corn, sweet potatoes, turnips and yams. You can bake cornbread and corn muffins with unrefined cornmeal, while taco shells and tortilla chips are available with this ingredient as well. Legumes -- such as beans and lentils -- contain complex carbohydrates. Consider adding beans to soups and casseroles, and serving them as side dishes. Some of these beans include black, butter, kidney, lima, navy and pinto. Lentils, split peas and black-eyed peas also contain starch. Chickpeas (garbanzo beans) are also complex carbohydrate foods, so you can obtain a significant amount of complex carbohydrates by eating hummus on whole grain bread.